PRINCETON, NJ -- Fifty-eight percent of Americans say health insurance companies would be justified in setting higher rates for people who smoke. This is on par with the 60% seen in 2011, but down modestly from 65% in 2003. Fewer, 41%, support setting higher rates for those who are significantly overweight, but this is among the higher support levels that Gallup has found for this policy in the last decade. These data, from Gallup's annual Consumption Habits survey, conducted July 10-14, have particular relevance because the recent healthcare legislation includes a provision allowing health insurance companies to charge higher rates for smokers. 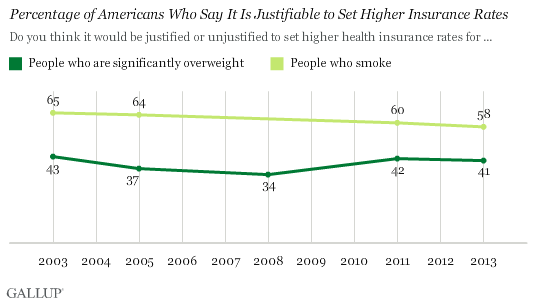 While a clear majority of Americans support setting higher health insurance rates for smokers, less than half say overweight Americans deserve the same treatment. This may reflect the prevalence of these issues in the U.S.: while 45% of Americans in Gallup's July Consumption Habits survey say they are overweight, 19% say they currently smoke. Americans who smoke or are overweight are less likely to support punitive insurance rates that would affect them personally. Twenty-eight percent of Americans who have smoked in the last week feel that higher insurance rates for smokers are justified, compared with 65% of those who have not smoked. Similarly, 34% of Americans who say they are overweight support setting higher health insurance rates for those who are overweight, contrasted with 47% among those who consider their weight to be about right. Republicans (47%) are more likely than Democrats (37%) to say it is justifiable to have higher health insurance rates for people who are significantly overweight. Republicans are also slightly more supportive than Democrats of setting higher insurance rates for smokers. Differences in smoking and weight status cannot explain these partisan differences: Democrats are one percentage point more likely to be overweight and to smoke than are Republicans. The majority of Americans believe that setting higher health insurance rates for smokers is justified, likely driven in part by the widespread support for this policy among nonsmokers. Fewer than half of Americans overall believe it would be justified to set higher health insurance rates for those who are significantly overweight, a policy that does not reach majority support even among those who feel their weight is about right. Skyrocketing health insurance costs have raised the issue of whether insurers should be able to charge higher rates for higher-risk policyholders. The Affordable Care Act includes a provision that allows insurance companies to charge higher rates for higher-risk policyholders, up to 1.5 times higher for people who smoke. However, a new regulation exempts those who are trying to quit smoking through a tobacco cessation program from this requirement. Support for higher health insurance rates for smokers and the significantly overweight is stronger among Republicans than among Democrats. The fact that higher rates for smokers are more widely considered justifiable than such rates for the significantly overweight may have contributed to the former's inclusion in the ACA. 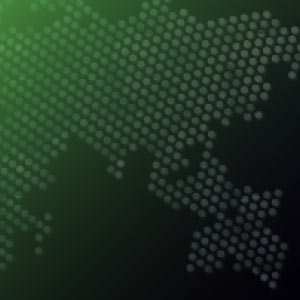 Results for this Gallup poll are based on telephone interviews conducted July 10-14, 2013, on the Gallup Daily tracking survey, with a random sample of 2,027 adults, aged 18 and older, living in all 50 U.S. states and the District of Columbia. For results based on the total sample of smokers, one can say with 95% confidence that the margin of sampling error is ±6 percentage points. Americans who smoke are more than twice as likely as those who don't to say they have friends and family who smoke. And those who are overweight and those who drink are more likely to associate with those who are or do.